The Minolta SR-7 is the first Minolta SLR to have a built-in exposure meter. In fact it was the worlds first 35mm SLR with a built in battery operated CdS-meter when introduced in 1962, and at the time Minolta's top of the line SLR camera model, usually equipped with the superb Auto Rokkor -PF 1:1.4 f=58mm standard lens with a depth-of-field pre-view lever. The meter is of the dual range variety, having a low and a high range selected by a push button, situated early on at the rear, and later, on model V, to the left of the lens mount on the side of the mirror housing. The meter reading, to be manually transferred to the lens aperture ring, is shown in a window next to the rewind knob at the top of the camera. The film speed is set on the shutter speed dial by lifting and turning to outer collar. 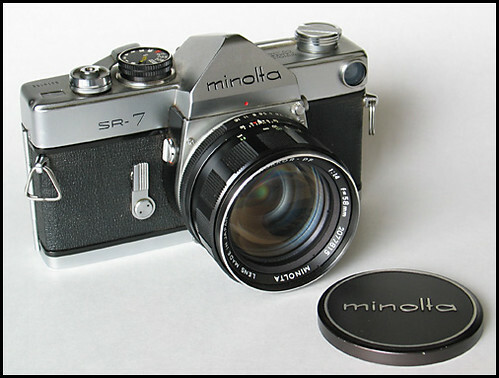 There are several versions of this camera, the most significant improvement is the 1965 revised body style, the SR-7 model V, which was also the basic body-style for the Minolta SR-T 101 to be introduced the following year. The improved style is recognized by the fact that the stepped shoulders on the camera body are removed. The camera has a built-in 10 seconds delay self-timer mechanism and features a mirror lock-up dial situated on the right-hand side of the mirror housing. The camera body design is particularly clean, having no integral accessory shoe at the top of the prism housing. The shoe was supplied as a separate item to be fixed to the camera using the viewfinder window frame, the early models having a screw-on fixing ring and the later ones a square push on fixture with a locking device. Shutter: Focal plane shutter with speeds 1 to 1/1000 sec. plus B, flash synchronized speeds 1 to 1/60 sec.